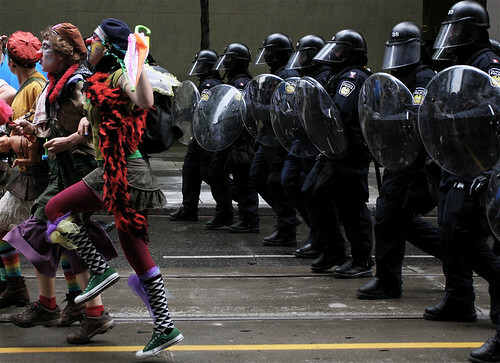 G20 visits Toronto. Democracy put on hold. Clowns and Police, originally uploaded by MCXL5. Yesterday marked the first day of the G20 Summit in Toronto, Canada. Traditionally, the G20 Summit is met with heavy protests, and a degradation towards violence, and the justification of police brutality. As a result, in the months that led up to Toronto’s G20, the Canadian federal, provincial and local governments joined forces to plan for and prepare for the worse, bringing in security from all over the country, and turning the downtown core, where the Summit would be held, into what has now been coined “the Fortress”. The pricetag: $1.2 billion CDN. Plausibly the most expensive 3-days in Canada’s history, and a historical record for the highest security cost incurred for any Group of 20 Summit. Government officials have justified the costs as being necessary due to the anticipation of violence. Canada also took steps to activate temporary laws that enabled police to search, detain and arrest people in and around Toronto’s downtown G20 security zone without cause: laws that fly in the face of Canada’s Constitution. The general public and government opposition has been incredulous. That is, until yesterday. Within hours, a small fraction was mobilized across the city using Black Bloc techniques, smashing windows, vandalizing property, looting stores and burning patrol cars. The city and general public has been stunned and outraged. Some are saying the government’s preparations and the security costs incurred, as well as police state laws, are now justified. Others are still questioning if it’s all actually been worth it, or necessary. “The cop was yelling at them ‘Back up!’ ‘Put your batons down! '” said Ruehle. “It was like an invitation (to the protesters),” said Ruehle. If this were the case, the implications are grave. A military state enforced. Police baiting violence that is causing public outrage and widespread support for further extreme police action against “protesters”. And as the Summit wears on, police are almost given public license to do what they need to at will. TVO’s Steve Paikin chronicled what he witnessed on Twitter in real time last night. I’d encourage anyone who hasn’t read his reports to do so. Is this really Canada? Is this democracy? Democracy is about freedom. Freedom to congregate, freedom to speak, freedom to be heard. Granted there are those that abuse democracy, but does that make democracy any less valid? As a society, we need to be careful – the erosion of democracy is a slippery slope. Even in the face of what can easily be justified as being a strong need for the “temporary” suspension of democracy – which in the case of this G20 Summit, occurred without public knowledge or effective communication thereafter. The scary part is that as many things, the appreciation and need for democracy is most noticeable when it’s gone. If we’re not careful, it may not be there when we need it most. An extreme reaction, although at face-value, may seem to be the simplest answer, however, it is not necessarily always the best one. More images and video footage from the day can be found at TO.Blog.